Coach might be eyeing expansion in China, but that doesn't mean it's forgotten about its other key markets. The American label has recruited London-based fashion blogger Emily Johnston of Fashion Foie Gras to help them create a bag for fellow online writers. This is one of Coach's most stylish handbags with its elegantly stitched corners, textured handles, and pretty racing stripe. The blue and white colors pay homage to America and Britain, and by extension the coming together of these international design talents. 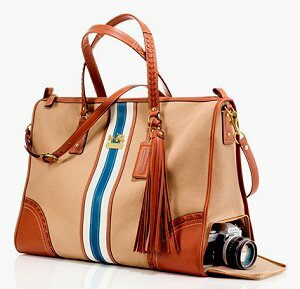 This Coach handbag has good looks on its side, but there are a few functional features designed to make bloggers giddy. The padded camera pocket ensures writers always have their faithful digital SLR handy. I also love the separate ballet flats compartment, perfect for those big nights spent covering a nightclub opening or fashion event. The top handles and longer shoulder strap give us a few carrying choices. Johnston said her "feet haven't touched the ground" since she was presented with the collaborative opportunity. She added that she has always held Coach "in such high regard," and so found the design process both terrifying and exhilarating. "I couldn't be prouder or more pleased with what we have produced," she added. The Fashion Foie Gras blogger bag is available exclusively from Coac'’s London flagship store on New Bond Street for £495.